This tutorial builds on what you learned in the first RevoScaleR tutorial by exploring the functions, techniques, and issues arising when working with larger data sets. As before, you'll work with sample data to complete the steps, except this time you will use a much larger data set. To really get a feel for RevoScaleR, you should work with functions using a larger data set. Larger data sets are available for download from this web page. AirOnTime87to12: An .xdf file containing information on flight arrival and departure details for all commercial flights within the USA, from October 1987 to December 2012. This is a large dataset: there are nearly 150 million records in total. It is just under 4 GB unpacked. AirOnTime7Pct: A 7% subsample of AirOnTimeData87to12. This is an .xdf file containing just the variables used in the examples in this tutorial. It can be used as an alternative. This subsample contains a little over 10 million rows of data. It is about 100 MB unpacked. Data by month can be downloaded as comma-delimited text files from the Research and Innovative Technology Administration (RITA) of the Bureau of Transportation Statistics web site (http://www.transtats.bts.gov/DL_SelectFields.asp?Table_ID=236). Data from 1987 through 2012 has been imported into an .xdf file named AirOnTime87to12.xdf. A much smaller subset containing 7% of the observations for the variables used in this example is also available as AirOnTime7Pct.xdf. This subsample contains a little over 10 million rows of data, so has about 60 times the rows of the smaller subsample used in the previous example. More information on this data set can be found in the help file: ?AirOnTime87to12. To view the help file, enter the file name at the > prompt in the R interactive window. Use the rxGetInfo function to get summary information on the active data set. The full data set has 46 variables and almost 150 million observations. Data stored in the xdf file format can be read into a data frame, allowing the user to choose the rows and columns. For example, read 1000 rows beginning at the 100,000th row for the variables ArrDelay, DepDelay, and DayOfWeek. But this is only 1/148,619 of the rows contained in the full data set. If we try to read all the rows of these columns, we will likely run into memory problems. For example, on most systems with 8GB or less of RAM, running the commented code below will fail on the full data set with a "cannot allocate vector" error. In the next section you will see how you can analyze a data set that is too big to fit into memory by using RevoScaleR functions. Notice that because we specified cube = TRUE, we have an estimated coefficient for each day of the week (and not the intercept). Because the computation is so fast, we can easily expand our analysis. For example, we can compare Arrival Delays with Departure Delays. 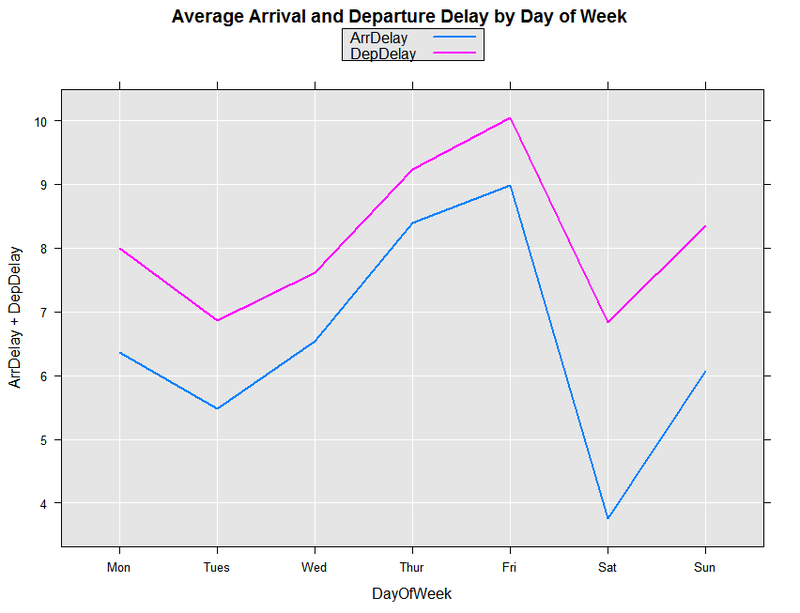 First, we rerun the linear model, this time using Departure Delay as the dependent variable. Next, combine the information from regression output in a data frame for plotting. The data set contains a variable UniqueCarrier which contains airline codes for 29 carriers. Because the RevoScaleR Compute Engine handles factor variables so efficiently, we can do a linear regression looking at the Arrival Delay by Carrier. This will take a little longer, of course, than the previous analysis, because we are estimating 29 instead of 7 factor levels. Next, sort the coefficient vector so that the we can see the airlines with the highest and lowest values. "United's additional delay compared with Hawaiian: 7.983628"
 "United's additional delay accounting for dep and arr location: 2.045264"
 "Number of coefficients estimated:  780"
We can continue in this process, next adding variables to take account of the hour of day that the flight departed. Using the F function around the CRSDepTime will break the variable into factor categories, with one level for each hour of the day. "Number of coefficients estimated:  30"
 "United's additional delay accounting for dep and arr location: 2.045264"  "Number of coefficients estimated:  780"
 "United's additional delay accounting for location and time: 0.837038"  "Number of coefficients estimated:  805"
Up to now, all of our examples have assumed you are running your computations on a single computer, which might have multiple computational cores. Many users with large data to analyze, however, have access to compute clusters that work together to provide greater computing power. With RevoScaleR, you can easily connect to a Hadoop cluster and distribute your computation among the various nodes of the cluster. Here we will show a quick example of using a Spark (Hadoop) cluster consisting of a name node and one or more data nodes. To connect to a high availability cluster using default values, you only need to provide the cluster nameNode and port. The nameNode manages the namespace of the cluster. The computations are automatically distributed over all the nodes of the cluster.